Most thigh injuries are sudden onset or acute, such as a thigh strain, groin strain or hamstring strain. Chronic thigh pain occurs gradually over time where the patient cannot identify a specific point of injury, or it may develop following an acute injury which fails to heal. The most common cause of sudden onset pain at the back of the thigh (posterior thigh pain) is a Hamstring strain. Symptoms include a sudden sharp pain at the back of the thigh, usually when running or kicking and it is unlikely the athlete will be able to continue running after a torn hamstring. Treatment includes immediate first aid applying the PRICE principles (protection, rest, ice, compression, and elevation) followed by a progressive rehabilitation program of stretching and strengthening exercises. Cramp is a sudden and often painful involuntary contraction of the hamstring muscle. The athlete will have difficulty straightening the leg for a while but cramp usually wears off. However, severe cramp can cause injury to the muscle resulting in a hamstring strain. A contusion is an injury to the muscle caused by a direct blow or impact. Often this is mild but contusions can be very serious and if not treated correctly result in permanent damage to muscle and nerves. All contusions should be treated immediately with cold therapy and compression. Applying heat or massage is definitely not advised. Treatment and rehabilitation will vary depending on how bad the injury is (graded 1, 2 or 3). Read more on posterior thigh pain. Injuries causing pain at the top upper hamstring area include Hamstring tendon strain (tear of the tendon), or an Avulsion strain which occurs when the tendon tears pulling a small piece of the bone away with it. This is more common in younger athletes (14-18-year-olds) and older people who may have had a history of chronic hamstring tendinitis. If a young person suffers pain right at the top of the hamstrings near the buttocks then an avulsion strain should always be suspected and professional medical advice sought. 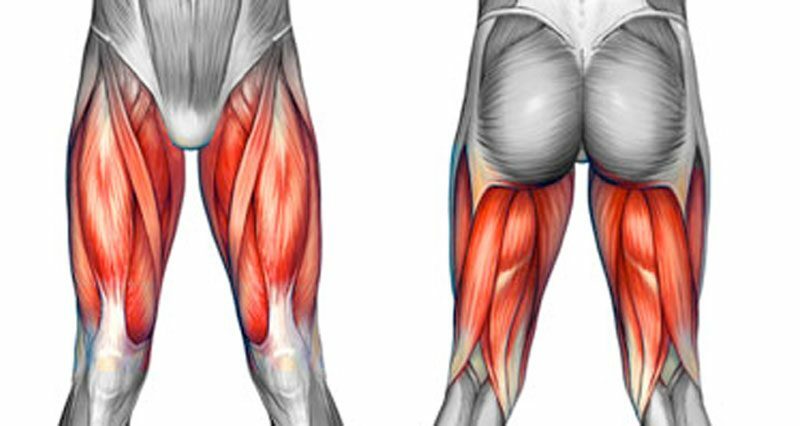 Hamstring origin tendonitis is inflammation of the hamstring tendon as it attaches to the ischial tuberosity at the top of the back of the thigh. It may occur following a hamstring tendon strain which has failed to heal properly. 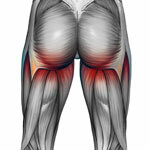 Symptoms include pain and tenderness just under the buttocks at the top of the hamstring tendon. Iscioglutial bursitis is inflammation of the bursa that lies between the bottom of the pelvis (Ischial tuberosity) and the tendon of a hamstring muscle. Symptoms are identical to hamstring origin tendonitis. Referred hamstring pain is caused by an injury or problem elsewhere such as the lower back, sacroiliac joints or muscles of the buttocks such as the gluteus maximus and piriformis muscle. Identifying the underlying injury and cause of the pain is needed. Symptoms include pain which may be sudden onset but is usually gradual onset where no specific point of injury can be identified. Posterior compartment syndrome occurs when the muscle swells up too big for the sheath that surrounds it causing pressure and pain. Symptoms include a dull pain in the back of the thigh, cramp, and weakness. It is caused either by overuse as might be seen in endurance runners or repeated trauma from redcurrant hamstring strains. Surgery is thought to be the most effective form of treatment. A Thigh strain (quadriceps strain) is a tear of one of the quadriceps muscles and a common cause of sudden onset pain at the front of the thigh. Sudden sharp pain is felt at the front of the thigh and depending on severity, swelling and bruising may develop. A Thigh contusion, also known as a dead leg or charley horse is caused by a direct blow or impact to the thigh, crushing the muscle tissue against the thigh bone (femur). If contusions are not treated properly with cold therapy, compression and rest then Myositis ossificans may occur which is a more serious chronic condition causing bone growth within the muscle. Read more on front thigh pain. Probably the most common cause of pain on the inside of the thigh is a groin strain. 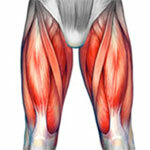 This is a tear of one of the adductor muscles on the inner thigh. Sudden sharp pain is felt, usually whilst sprinting or turning sharply. Depending on how bad the strain is there may be swelling and bruising. Immediate treatment is applying cold therapy and compression followed by a full groin strain rehabilitation program. 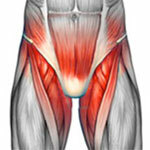 Causes of gradual onset groin pain include inflammation of the adductor muscle tendons (groin inflammation), Inguinal hernia which occurs when part of the internal tissue which can be fat, muscle or intestine bulge through a weakness in the overlying abdominal wall, and ‘Gilmore’s groin‘ which is a complex muscular-tendinous dislocation of the lower abdomen. Read more on Groin pain. 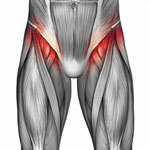 Upper thigh pain refers to pain at the top of the quadriceps muscles/front of the hip. A Rectus femoris tendon strain is a tear of the tendon of the rectus femoris at the point it attaches to the pelvis at the front of the hip. Sudden sharp pain is felt at the very top of the muscle where it attaches to the pelvis with localized swelling at the point of injury. Occasionally the tendon may tear pulling a piece of bone with it, called an avulsion strain. It is essential an accurate diagnosis is made to rule out an avulsion strain. If suspected, professional advice should be sought. Rectus femoris tendonitis or tendinopathy is inflammation (or degeneration) of the rectus femoris tendon at front of the hip. Symptoms include a gradual onset of pain and tenderness at the front of the hip, or it may develop following a tendon strain or avulsion strain which has failed to heal properly. The femur bone is the long thigh bone. Prolonged overuse can cause a stress fracture. The main symptom of a femur stress fracture is a dull ache deep in the general area of the thigh. There is likely to be a pain when a bending force is applied to the femur, known as the hang test. Read more on femur stress fractures. Very severe pain in the thigh following a high impact collision such as a high impact collision on a sports field or a Road Traffic Accident. This may indicate a fracture of the femur which is a very serious injury as they tend to be associated with excessive bleeding internally. Severe pain in the thigh after and direct impact e.g. opponents knee to the front of the thigh. In some rare cases, the resulting bleeding that occurs can be excessive and lead to compartment syndrome which is a very serious condition. Severe pain in the thigh followed by an inability to straighten or bend the knee and a palpable (able to feel) gap in the muscle. This may be a grade 3 rupture of the muscle and may need surgery if it occurs at either end of the muscle at the junction with the bone. Altered sensation (“pins and needles” feeling or loss of feeling) in the lower leg following a thigh injury. If you have a more long-term injury or one which recurs then also seek professional advice. Most muscle injuries will benefit from sports massage to increase blood flow and healing to the area as well as make scar tissue more elastic helping to prevent the injury from recurring.